Portland Region 2040 Vision–What’s Next? I was asked this question recently and here’s what I said. . . Since its inception in 1995, the 2040 Growth Concept has promoted compact, mixed-use, transit-oriented development in centers and corridors. This has been central to shaping regional growth patterns, limiting sprawl and creating livable communities. In fact, directing growth into centers & corridors has been the region’s primary strategy for preserving farms, forests and natural areas outside the Urban Growth Boundary. Metro policymakers (and I myself) believe that compact development is the premier tool to address climate change, ensure equity, create jobs and protect the region’s quality of life. Most cities in the region know that they must promote walkable urbanism–but sometimes their policymakers forget. This image is from Beaverton’s Civic Plan. Boomers and Millenials both show a strong preference for “Walkable Urbanism.” Some suburban policymakers responses to Metro’s Climate Smart Communities (CSC) project shows that many of them are not aware that this first trend means that they should be focusing more of their infrastructure dollars towards “retrofitting suburbia” rather than building and widening roads. I worked hard to see that urban form/urban design was in the strategies tested in the CSC project (and indeed it tested at the top! ), but many suburban policymakers would rather focus on electric vehicles and other technology for lowering tail pipe emissions. More needs to be done to alert them that their present course will potentially lead to stranded assets where there is little market left for suburban single-family homes that don’t provide the opportunity to walk to needed services and amenities. There is a growing recognition of the unacceptable impacts of inequality (racial, social, financial). Inequality impacts such issues as housing affordability, homelessness, displacement and even sprawl as people seek more affordable housing in towns outside the Metro Urban Growth Boundary. Thanks to Bernie Sanders, financial inequality (the widening income gap) has become a chief topic of presidential debates and led to more discussion of the role that the Federal government should play. Meanwhile, Metro has attempted to address several aspects of inequality. This report mentions Community Land Trust as a strategy. But it needs to become THE major strategy if we are to address housing costs for a 2040 workforce. Regarding Metro’s Strategic Plan to Advance Diversity, Equity, and Inclusion Metro’s COO Martha Bennett said “the priorities are to learn more about best practices, apply equity plans to its service-delivery areas, improve community engagement and use equity as a measure of decision-making in spending money.” Any build out of the 2040 Growth Plan will need to address gentrification, displacement and contracting opportunities in an equity strategy that focuses on communities of color. Metro has pursued affordable housing strategies for many years—the latest effort being the Equitable Housing Initiative headed up by Councilor Sam Chase. From Metro’s web site: The Initiative’s Report discusses a variety of tools that could help, including financial assistance for residents, renter protections against evictions and nonprofit community land trusts. . . I agree that Metro should utilize the Community Land Trust model, but not just for the involuntarily low-income. I would like to see governments in the region, including Metro, promoting the CLT for ALL OF US. The original impetus behind the CLT movement was to create a new institution to keep housing permanently affordable. The first people I ever met living in a CLT were NOT low-income, rather middle-income people who saw it as a better way. Probably the local government that best understood its potential was Burlington, VT under then-mayor Bernie Sanders. The City of Burlington under Sanders helped to support the formation of the Burlington Community Land Trust. It’s now the Champlain Housing Trust, the largest CLT in the US and a model for local governments looking for systemic solutions. Champlain Housing Trust is the largest Community Land Trust in the nation. It enables housing to be kept permanently affordable by holding title to the land under both multifamily and single family homes–both rented and owned. Image from CHT 2014 Annual Report: http://www.getahome.org/learn-more/publications. I believe the CLT is the best tool for transforming our housing system. By taking the land under housing off the private, commodity, speculative market, it helps to change the concept of housing from a commodity to be bought and sold for a profit. Instead it encourages us to see it as a social good that everyone needs and deserves. “By looking at housing as a fundamental human right rather than a market good that goes to the highest bidder, and with shrewd political organizing in a hostile environment, housing advocates in Burlington have created a sustainable model for affordable housing that deserves to be emulated across the country” says Daniel Fireside in Burlington Busts the Affordable Housing Debate. The Portland region has a Community Land Trust, Proud Ground (formerly Portland Community Land Trust and Clackamas Community Land Trust). Personally, I feel that it is far too focused on home ownership rather than a mix of ownership and rental. Nonetheless, Metro should explore developing a relationship with it similar to that of Burlington and CHT. Woolsey Corner in the New Columbia community of Portland was developed as a Community Land Trust by Proud Ground utilizing Orange Splott as its developer. Photo courtesy of Orange Splott. For the shorter term, it should work with innovative housing developer Orange Splott, LLC and its network of other small incremental developers in promoting more alternatives to conventional home ownership. Let me repeat, these alternatives should be marketed not just to “the poor” but to ALL OF US! For Metro, this work could come under the banner of the Equitable Housing Initiative, but it needs to be larger than “affordable housing.” Rather it needs to focus on housing affordability involving ALL income levels. In the long run, hopefully before 2040, such efforts by Metro will help to change the concept of housing from a commodity to a social good. Metro might look into working with the Regional Arts and Culture Council to produce a toolkit to encourage every community in the region to integrate arts and culture. Transportation for America has produced a Creative Placemaking Handbook that could provide a good start. Tigard Mayor welcomes New Urbanist Jeff Speck for two days of talks and workshops on making Tigard, a suburban community in the Portland Metro area, more walkable. Photo by PlanGreen. Members of the Congress for the New Urbanism have a great deal of expertise in excellent urban design. Metro should continue to develop a partnership with the Portland-based non-profit National Charrette Institute, a leading affiliate and powerful voice within CNU. As presented at the New Partners for Smart Growth Conference by Council Member Craig Dirksen, the Investment Areas Approach with its Shared Investments Strategy highlighted both the City of Tigard and the Tigard Triangle in the SW Corridor Investment Area. New Urbanists are having strong influence over Tigard’s redevelopment and this trend should be encouraged. Metro is connecting its natural area at Canemah Bluff with a riverwalk along the Willamette River. This will make Oregon City even more appealing as a place to live and work. Photo by PlanGreen. Metro should continue its long-standing relationship with The Intertwine regarding the integration of parks and natural areas into developing centers and corridors. This coalitions of organizations have long been involved with implementation of Titles 3 and 13 of the 2040 Concept. It should consider expanding relationships with environmentally oriented organizations that represent communities of color (some of whom are in The Intertwine). As mentioned above in the inequality trend, any urban design efforts must take into account gentrification and displacement. They must also take into account inequitable air quality impacts. What do you think about my three key trends re: implementing the 2040 Growth Concept–and my ideas on what Metro should do about them? What are your ideas? This entry was posted in 2040 Growth Concept, Centers & Corridors, Climate Change, Community Land Trust Model, Design Matters, Housing Affordability, New Urbanism, Sprawl Repair, Sustainability, Trends, Urban Design, Walkable Urbanism and tagged Bernie Sanders, Burlington Community Land Trust, Champlain Housing Trust, Clackamas Community Land Trust, Climate Smart Communities, Co-Housing, Community Land Trusts, Congress for the New Urbanism, Craig Dirksen, Creative Placemaking Handbook, Daniel Fireside, Gentrification, inequality, Jeff Speck, Martha Bennett, Metro, National Charrette Institute, new urbanism, Orange Splott, Portland Community Land Trust, Proud Ground, Sam Chase, The Intertwine, Transportation 4 America on April 4, 2016 by Mary Vogel. Where is Toronto’s Green Waterfront in 2015? In 2007 when I wrote Greening Waterfront Development: Toronto, I was highly impressed with official plans for greening Toronto’s waterfront. Our two day tour with Greater Portland Inc, had Waterfront Revitalization on the agenda, but we didn’t get to the area that I wanted to see–the re-naturalizing of the mouth of the Don River. So after our debriefing on Sept. 30, I rented a bike at HI Toronto and headed towards the Waterfront Trail then east towards the Don River. I wanted to document the progress Toronto had made in their plans to transform the mouth of this highly channelized river that I had written about in my 2007 article. I soon ran out of separated bike trail and plush new development and came to a channel with a short bridge over it. With a bit of incredulity in my voice, I asked “Is THIS the mouth of the Don River?” of the fellow who turned out to be the drawbridge operator. I had already crossed this drawbridge when it opened for a barge carrying dredge materials. Photo by PlanGreen. He assured me that it was. Then I asked “What about the re-naturalization they were going to be doing?” He told me that volunteers had been doing some planting in the park down the way so I headed into the industrial area along Villers Street making a first stop at a small public pier to capture the drawbridge opening. I was crestfallen to see the mouth of the river was still in its concrete channel and brown from sediment. Active dredging was still taking place. In fact, the drawbridge was opening for a barge carrying dredge material upriver in what is called the Keating Channel. I did find some native species and a sign corroborating what the drawbridge operator had told me. But the scale of the ecological restoration that needs to be done there came nowhere close to the scale of the earth moving and skyscraper building that is taking place nearby. In fact, it seemed to be the proverbial drop in the bucket. I found it disappointing that any city with 180 towering cranes in its core area alone was not making equally fast progress with the ecological restoration of one of its major rivers. It leads me to ask what kind of public benefit is the City extracting from each of these developments? Recommendations to re-naturalize the mouth of the Don River have been in existence since 1991. According to a Wikipedia article on the Don: In 2007, the Toronto Waterfront Development Corporation (now WaterfrontToronto) held a design competition that looked at four different configurations for the mouth of the Don. The winning bid was made by Michael Van Valkenburgh Associates. The environmental assessment is expected to be complete in 2008 and construction is scheduled to begin in 2010. That Environmental Assessment was only passed by the province January 26, 2015–a 7 year lag! This was not because of the economic “recession.” We were told that did not phase Toronto. This 2007 award-winning plan by Michael Van Valkenburg associates can be found here http://www.mvvainc.com/project.php?id=60–along with many other tantalizing images. When I reviewed the plans by Michael Van Valkenburg Associates, I was reminded that Instead of creating naturalized banks along the straight course of the existing channel connecting the Don River with the lake, as was originally suggested in the project brief, MVVA’s design keeps the Keating Channel as an urban artifact and neighborhood amenity and creates a new mouth for the river that flows logically from the upstream source, bypassing the abrupt right turn created by the channel. A large new meandering riverfront park becomes the centerpiece of a new mixed-use neighborhood.
. . . in the fall of 2011 Mayor Rob Ford, his brother Councillor Doug Ford, their right-wing allies, and competing development agencies, attempted to hijack current waterfront planning processes and radically alter plans for the Port Lands. Those sympathetic to Mayor Ford’s vision see these lands primarily as a way to ease budget woes by selling prime waterfront property to international developers. As the Toronto Star editorialized, “The Fords’ ludicrous vision for the future – complete with a megamall, monorail and giant Ferris wheel – was so abysmal that a tide of Torontonians rose up in protest. Most city councillors broke with the mayor’s program and quashed the takeover [of Waterfront Toronto].”31 At the time of writing [no date provided], a political solution is being sought in which Waterfront Toronto, the City, and various special purpose government organizations are working to design a compromise between Ford’s “ludicrous vision” and the plan based on the MVVA proposal. According to Waterfront Toronto website, construction of the Lower Don Lands Plan and the Port Lands Plan is yet to come. There is no mention of the above controversy on their site. The due diligence work being primarily undertaken by Waterfront Toronto will provide governments with additional assurance on the estimated $975 million cost of this project, which includes rerouting the Don River to the middle of the Port Lands between the Ship Channel and the Keating Channel, remediating the area’s contaminated soil, creating new parks, wetlands and resilient urban infrastructure that will remove the flooding risk, unlock a vast area for revitalization and development – including the creation of a new community called Villiers Island – and create billions of dollars of economic development opportunities. So, to answer the question my title asks, “Where is Toronto’s Green Waterfront in 2015?”–LOOK FOR IT IN 2024! That estimate, of course, will depend upon continued economic progress–progress that seems a bit uncertain right now. This entry was posted in Downtown Livability, Ecosystem Services, Green Infrastucture, Habitat, Industrial lands, Land Use Planning, Sustainable Urbanism, Uncategorized, Urban Design, Watershed health, Wildlife Corridors and tagged biodiversity corridors, brownfields, Don River, Ecological Restoration, Ecosystem Services, Gardiner Expressway, green infrastructure, habitat connections, Lower Don Lands, native plants, Portl Lands, redevelopment, Sustainability, Toronto, Toronto Waterfront, Waterfront Toronto on October 13, 2015 by Mary Vogel. What Are We Willing to Sacrifice to Find New Industrial Lands? The City of Portland has reached a major decision point that will define whether it retains its reputation as a “green” city in the coming decades. Over the next year, the City will complete work on its Comprehensive Plan Update. The Comprehenisive Plan is the land use plan for the City that guides future growth and development. Among the most difficult issues to be addressed in this process is the challenge of finding new industrial lands. Under Statewide Land Use Planning Goal 9, cities are supposed to maintain a 20-year supply of industrial land. However, Portland is a landlocked city surrounded by other cities and has run out of undeveloped industrial parcels on which to expand. Analysis conducted by the City and Metro, based in large part on information provided by self-interested industrial landowners, has determined that Portland needs approximately 670 acres of new industrial land. As a result much of the Comprehensive Plan Update process has focused on a desperate search to find these 670 acres. Proposals to meet this demand for new industrial land include developing 300 acres of irreplaceable wildlife habitat on West Hayden Island, converting significant portions of 4 golf courses in North Portland to industrial use, limiting environmental regulations on industrial lands, integrating industrial development into neighborhoods, and cleaning up brownfields and restoring them to productive use. In short, the City is considering sacrificing the health of our environment, our valuable greenspaces, and the livability of our neighborhoods in order to meet this arbitrary target. However, there are some important things to understand that are often left out of the discussion. First, it is critical to understand that the land use system does allow the City to inform the State that it has run out of land and is unable to meet industrial land targets. State land use planning goals do not require the City to sacrifice our environment or our neighborhoods in order to meet industrial land goals. In fact Goal 9 explicitly states that industrial land objectives “should consider as a major determinant, the carrying capacity of the air, land and water resources of the planning area.” Instead, Portland should inform the State that it will meet job targets through strategies other than creation of new industrial lands. Second, the City has over 900 acres of brownfields — contaminated industrial sites that have either limited or no productive use. In short there are more than enough brownfield sites to meet the industrial land deficit. The problem has been that owners of these sites have been reticent to invest the capital to clean them up and put them back into productive use generic cialis overnight shipping. It is absolutely critical that the City develop an aggressive strategy to hold polluters accountable for these sites through a combination of enforcement actions and incentives. Finally, to the degree an industrial land crisis exists at all, it is a self-inflicted crisis. Although City forecasts predict a surplus of commercial and residential property, the City and industrial stakeholders have spent the last 15 years rapidly converting industrial lands to residential and commercial uses. Today the City brags about the transformation of the Pearl District and South Waterfront from “industrial wasteland” to high-end development. The Port of Portland, one of the loudest advocates for more industrial land, sold its property at Terminal One to make way for low-rise condos and it converted industrial land next to Portland International Airport for a big-box shopping center. Whether intentional or not, the strategy pursued by both industrial interests and the City over the past 15 years has been one of allowing industrial land owners to cash out by upzoning their industrial land to more profitable use and then backfilling the industrial land deficit through conversion of greenspace. The City should inform the State that it has run out of adequate undeveloped land to meet industrial land forecasts and therefore will develop other strategies to meet jobs supply objectives. This does not mean that the City will never add new industrial land to the inventory, but it does mean that the City will not be held hostage to an artificial target that would necessitate destruction of natural areas, open space, and neighborhoods. The City should develop an aggressive strategy to force industrial polluters to clean up brownfields. This should include a combination of enforcement actions as well as non-subsidy-based incentives. The City should put in place regulatory and non- regulatory programs to increase use intensification on the existing industrial landbase, something that is already occurring in cities in Europe and Asia that have a limited land supply. The City should put in place strong protections to prevent the rezoning of existing industrial lands except in extraordinary cases. The City and State should take a hard look at strategies to promote real collaboration and cooperation and potentially unification of the Columbia River Ports in order to maximize efficient use of land, promote a sustainable regional Port economy, and stabilize our Port system, which is on the brink of system failure. This is something which has been in the Port of Portland’s Marine Terminals Master Plan since 1991 but which has never been seriously pursued. We will keep you updated about opportunities to comment on the Comprehensive Plan Update during the coming year. You can leave comments for Bob below and write him at bsallinger@audubonportland.org to get on his list re: the Comp Plan. 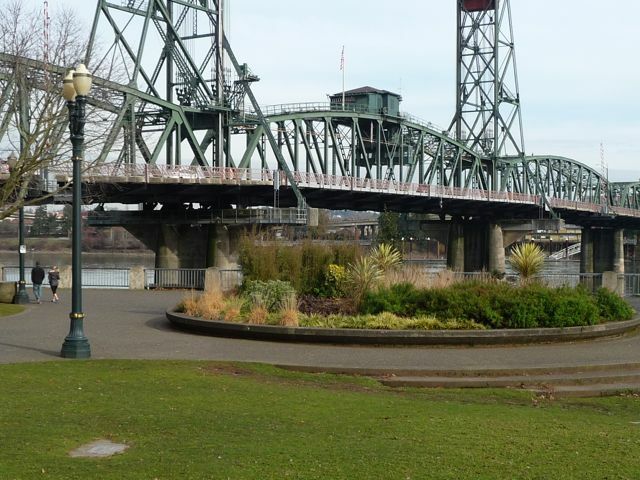 This entry was posted in Comprehensive Plan, Industrial lands, Land Use Planning, Master Plan, Sustainability, Sustainable Urbanism and tagged Audubon, Bob Sallinger, City of Portland, environmental health, green city on December 3, 2013 by Mary Vogel. The 19th annual Rail~Volution Conference was hosted by the Puget Sound Region in Seattle, WA on October 20 thru 23, 2013. The conference featured many workshops exploring how we can build livable communities through transit. This is especially important to the Puget Sound Region because they are anticipating 1.2 million more residents by 2030. To accommodate this, the region must plan for density in urban growth centers and make smart investments in transportation. Because PlanGreen principal, Mary Vogel, urged me to apply promptly as soon as she got notice from Rail-Volution, I was privileged to receive a scholarship to this conference. The first workshop I attended was “Rail~Volution 101” intended for first time attendees. One of the speakers was Earl Blumenauer, Congressman of Oregon’s Third District, who has notable experience with working towards livable communities. He founded Portland’s Regional Rail Summit in 1991 which eventually became the Rail~Volution conference in 1995. He spoke of the importance of citizen infrastructure in making a successful light rail system. In Portland, he funded a transportation class to allow citizens to work with the Portland transportation agencies to implement their own community projects. This is still happening! To him, strengthening this citizen infrastructure is a key to success. Learn more at portlandtransport.com. The second workshop I attended was titled “Design Matters.” The panel consisted of a planner, an architect, and a landscape architect. The planner, William Anderson, of San Diego, urged everyone involved in a project to “leave their discipline ego behind” in favor of effective collaboration and problem solving. Jeff Potter, architect from Dallas, TX, argued that “place is not designed, it is experienced.” William also argued the importance of making seamless connections to neighborhoods through transit to avoid making a community “just a place to pass through.” All panelists spoke to the important of context specific design that gives a place a sense of unique identity. Tuesday night was the Pecha Kucha Slam, described as “cutting edge ideas presented rapid-fire. 20 slides x 20 seconds = less than 7 minutes per topic.” 12 professionals presented a wide variety of topics from developing airports to keeping your employees healthy and fit. There was also a range of presentation styles: from serious to satirical to downright silly. Terra Lingley, Transportation Planner at CH2M Hill in Portland presented about Portland’s Streetcar Mobile Musicfest where local bands perform on the streetcars for free (except you still have to pay the streetcar fare). This was a big hit with the crowd! I was connected with a mentor, Circe Torruellas, of the Washington DC Department of Transportation. She shared with me her experience with transit planning in our nation’s capital. She also introduced me to people she knows in Portland who were at the conference including Art Pearce, of the Portland Bureau of Transportation. At the conference, I networked, had fun, and learned many things, including some information that went over my head such as the details surrounding how to finance Transit Oriented Development. There is a wealth of information about the conference on their website: railvolution.org including a list of attendees and some webcasted sessions. My experience at the conference has made me very excited to continue down the path to be an urban planner. This entry was posted in Context Sensitive Design, Design Matters, Financing, Land Use Planning, Millenials, Real Estate, Sustainability, Sustainable Urbanism, Transportation and Land Use, Trends, Walkability, What's Next? and tagged civic engagement, community investment, Earl Blumenauer, GB Harrington, Pecha Kucha, Rail-Volution 2013, redevelopment, Streetcar Mobile Musicfest, sustainable urbanism, Transit Adjacent Development, Transit-Oriented Development, walkable neighborhoods on November 12, 2013 by Mary Vogel. 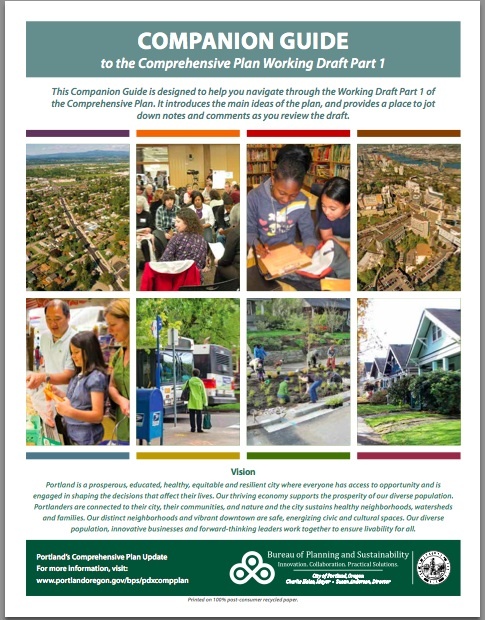 The Portland Comp Plan Working Draft 1 released in January, 2013 begins to envision that new kind of city for this “huge moment in history.” It includes a transportation network that aspires to integrate nature into neighborhoods through civic corridors, neighborhood greenways and habitat connections. By doing that it seeks to: 1) increase people’s access to the outdoors, 2) provide corridors for wildlife movement, and 3) catch and treat stormwater.Its Watershed Health and the Environment chapter encourages the protection/enhancement of natural systems and their role in promoting public health—as you might expect from a chapter with that heading. 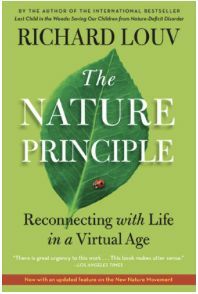 However the emphasis on “designing with nature” in both its Design and Development chapter and its Transportation chapter is what really sets this plan apart and makes it transformational. It puts Portland ahead of the curve in creating Louv’s new kind of city! The fact that we have such wise and forward-thinking planners and advisory groups to create such a draft plan does NOT mean that the work is over, however. The devil is in the details! So, I hope that you will review those details, attend a community workshop or two, and add your thoughts. Below, I’m sharing some of my own comments on the Comp Plan Working Draft 1 in hopes that you will voice your support for them as well as develop your own points. I was excited to see the draft Comp Plan promise (p,14) “encouraging building and site designs that have native plants and more permeable surfaces and mimic nature, so that pollutants stay out of rivers and streams.” Only once in the actual policies, however, is there any mention of native vegetation. And that one citation is followed by an exception big enough to let an area that could be a haven for more native wildlife—the west side of the Willamette River from the Steel to the Ross Island Bridges—stand as is: largely bereft of native vegetation. Policy 4.3 Vegetation. Protect, enhance and restore native AND OTHER BENEFICIAL (emphasis mine) vegetation in riparian corridors, wetlands, floodplains and upland areas. Policy 4.3 Vegetation. Protect, enhance and restore native vegetation throughout the landscape. 4.3a. Riparian Corridors, Wetlands, And Floodplains: Protect, enhance and restore native vegetation in critical wildlife areas such as riparian corridors, wetlands, and floodplains. 4.3b. Upland Areas: Protect and enhance native and other beneficial tree species. Restore the landscape with diverse native species including trees, shrubs and wildflowers. My further comments on Policy 4.3: Since riparian corridors, wetlands, and floodplains are the most critical areas for wildlife they are the most important to be restored to predominantly native plants. What we plant from here on out along our rivers, streams and wetlands should be native check over here. Remove “and other beneficial” vegetation from the policy. For an alien species to contribute to the ecosystem it has invaded, it must interact with the other species in that ecosystem in the same ways that the species it has displaced interacted. . . This contribution is most likely when species have evolved together over long periods of time. 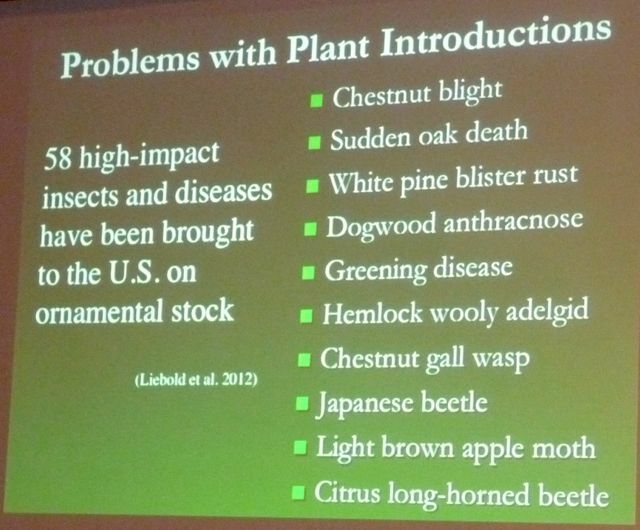 Tallamy’s slide show at Oregon Community Trees conference left community foresters committed to using native trees. The Comp Plan needs to stress the need to plant more NATIVE trees and plants in upland areas too. See my next blog, Portland: A New Kind of City II for further comments on Working Draft 1 of the Portland Comp Plan. This entry was posted in Alien ornamentals, Biodiversity, Biophilia, Bringing Nature Home, Comprehensive Plan, Ecosystem Services, Green Building, Habitat, Land Use Planning, Portland Plan, Sustainability, Sustainable Urbanism, The Nature Principle, Trends and tagged biodiversity corridors, Bringing Nature Home, Doug Tallamy, Ecosystem Services, floodplains, green streets, habitat connections, Leaf Litter, Portland Comprehensive Plan, redevelopment, Richard Louv, riparian areas, Sustainability, The Nature Principle, uplands, walkable neighborhoods, wetlands on February 6, 2013 by Mary Vogel. I’m Mary Vogel and I’m speaking on behalf of myself and my Woman Business Enterprise, PlanGreen. Thank you for this opportunity to testify on Portland’s Legislative Agenda for 2013! As most of you know studded tires cut road life in HALF in Oregon!!! I live in downtown Portland where my major forms of transportation are walking and biking, so I am able to see and hear the villains doing it—one click, click, click, clack, clack, clack at a time. First, deal with a major and unnecessary cause of road wear & tear in Oregon by banning studded tires. ODOT estimates that studded tires cause $40 million in damage to our roads each year. That results in a fine dust that gets in the air, on the land and, eventually, is washed into our rivers. While data show that only 10% of Oregonians west of the Cascades use studded tires, I think they all commute into downtown Portland every weekday. It seems like every third car that passes me on my bike has them—raising the hair on the back of my neck with their aggressive sound. In the women over 50 age category, I may be one of the few who meet the level of “strong and fearless,” but I will admit that studded tires rattle my nerves and make me feel less safe. What they do to the pavement certainly makes the roads less safe for all cyclists. So, not only do studded tires cost us a lot more in road maintenance, they cost us more in public health; they cost us more in carbon footprint; they cost us more in the livability of our cities. During a time of fiscal and climate crisis, to continue to allow studded tires is irresponsible! Please ask the legislature to ban studded tires in Oregon! Add First, deal with a major and unnecessary cause of road wear & tear in Oregon by banning studded tires to your points under Modernize & Enhance Transportation Funding. Or make it a separate point under the city’s Transportation agenda. But please do this today as we are long overdue! This entry was posted in Bicyclling, Climate Change, Downtown Livability, Land Use Planning, Sustainability, Transportation and Land Use, Walkability and tagged cars, climate change, environment, financial crisis, Financing, Sustainability, sustainable urbanism, walkable neighborhoods on January 17, 2013 by Mary Vogel. As I explained in Part 1 of Bringing the Wild Back to the City, I’m trying to take members of the built environment community to the wild to show them how nature does things in ways that are often more efficient, elegant and pleasing to the eye than what we design. Last week, I was presented with an opportunity to put this knowledge into action. 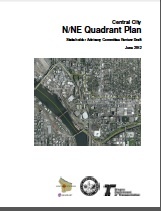 At a meeting on Portland’s NE Quadrant Plan last week, as I picked up the written comments of Audubon Society of Portland’s Conservation Director, Bob Sallinger, I was asked if I wanted to testify myself. At first, I declined, but after reading Bob’s comments, I was inspired to expand upon them. I’m testifying to endorse and expand upon the comments of Bob Sallinger (Audubon Society of Portland) on the SAC draft NE Quadrant Plan. I have several relevant affiliations, but I’m testifying only on behalf of myself and my Woman Business Enterprise, PlanGreen. I’m also an Audubon member who once played a role on its Conservation Committee. My comments are all aimed at increasing the ecosystem services of our landscapes, letting nature help us create infrastructure that is sustainable, efficient and aesthetically appealing. What’s in black, bold italic are Sallinger’s points. The rest is my expansion. 1. Protect undeveloped river banks and riparian buffers and add strong language to restore developed banks when redevelopment occurs. When I was writing an article for Urban Land on Portland as a model for waterfront redevelopment, one of the most impressive tools I downloaded was the Willamette Riverbank Design Notebook (done by a team chaired by Mike Abbaté, now Director of Portland Parks). I was thrilled to see a city trying to make room for other species–even in its most urban and urbanizing areas. This is a mark of true wisdom. Please reference and utilize this unique document during implementation phase. 2. Include specific targets for ecoroofs and other green infrastructure from the watershed plan. 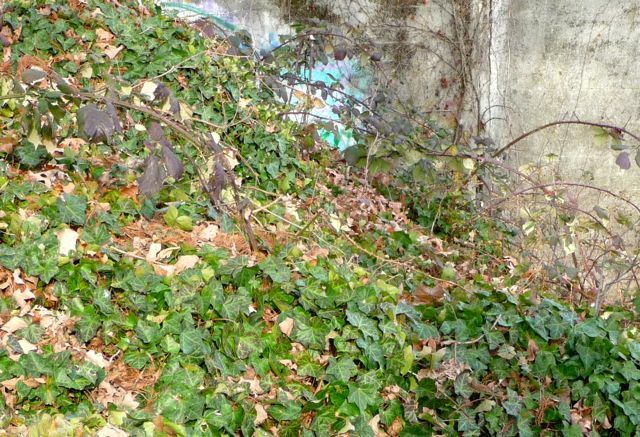 To this I would add that to truly follow through on Portland’s world class Watershed Management Plan, any ecoroofs, bioswales, raingardens, green walls,, parks, etc., need to use the landscape to provide far greater ecosystem services than those extant today. If we use NATIVE plant communities rather than the incipient invasive species, such as Nandina, that are so greatly overused in bioswales on Portland’s green streets today, we will provide habitat for the base of the food chain, our native insects. Insects are so important, not only for all the jobs they do–like pollination and detritus decomposition–but as food for the birds that provide us with additional services in keeping a balanced urban ecosystem–in addition to the beauty and delight that they provide us. 3. Reference the tree targets in the Urban Forestry Plan. Again, I believe that much more effort should be put to planting NATIVE trees. If sidewalk uplift is a potential problem, then utilize a technology such as Deep Root that will prevent it. As a Tree Crew Leader for Friends of Trees, I always compliment a homeowner who has chosen a native tree. Invariably, the other homeowners on my crew say “We would have chosen native too, if we had known.” Recent Oregon Community Trees keynote speaker, Doug Tallamy, told the Chicago Tribune that while Portland is lush and beautiful, it is DEAD. 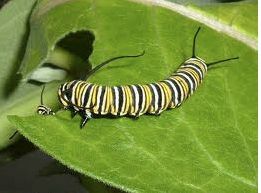 That’s because the overwhelming majority of our vegetation is non-native and the larvae of our native insects need native plants to complete their cycle into adults. 4. Encourage bird-friendly building design utilizing the “Resource Guide for Bird–friendly Building Design” recently published by Audubon, along with the City and USFWS. Thank you so much for your time. And by the way, I want to say that as someone who lives downtown and walks and bikes nearly everywhere I go, I couldn’t disagree more with the last speaker (Terry Parker) who called for increasing auto capacity to the level that you increase the density. That is definitely not needed and, in fact, counterproductive. This entry was posted in Biophilia, Central City 2035, Ecosystem Services, Land Use Planning, Sustainability on July 2, 2012 by Mary Vogel.